My new neighbors were driving home from NC on Monday and I knew they were going to be stressed, so I decided to make dinner for them, while making dinner for us at the same time. Since I decided to make a chicken pie, it was extremely easy for me to double ingredients and make two dinners at the same time. This is one of my favorite things to make, so I hope you’ll try this recipe some day… it’s a great comfort meal with lots of old-home appeal. I started with one rotisserie chicken that I bought from the grocery store. I put the chicken and all its juices into a large stock pot, added water up to the halfway point of the bird, then set the pot to simmer on medium low for about a half hour. While it was cooking, I threw in some leftover veggies that I had in the fridge (three stems of broccoli without the crowns and six chunks of celery) and allowed them to perfume the water until it became stock. NOTE: This is my favorite way to make stock… although I usually use carrots, celery, and onion, this turns plain water into something you can use in a myriad of ways. Once the chicken had cooked in the liquid long enough to be easy to shred, I removed the meat and vegetables to a colander (I used a set of tongs and the chicken fell apart nicely as I removed it from the pot). I then strained the stock through the same colander and into a bowl big enough to hold all the stock so I could use the same pot to start making the chicken pie sauce. To make the sauce, I started with four Tablespoons of margarine and/or butter and four Tablespoons of flour and whisked them together over medium heat until the fat had time to cook the “raw” taste out of the flour. NOTE: Remember, we’re making enough sauce for two chicken pies. I then added about one cup of chardonnay white wine (Use whatever wine you prefer) and whisked the sauce to incorporate the wine. It was still very stiff at this point, so I added an equal amount (equal parts wine to chicken stock) of the reserved chicken stock to the sauce and whisked that until things started looking like a “sauce”. Feel free to add more wine or stock to get the sauce to the consistency you want for your chicken pie. I actually went back and added more of both the wine *and* stock, but made the sauce too thin. TO FIX THIS, I used 1/4 cup of reserved stock and 2 teaspoons of cornstarch to create a slurry and added it to the sauce, whisking to make sure not to create any lumps. Once I had enough of the thickened sauce, I needed to season it before adding it to the dish. I used freshly ground pepper, some Herbes de Provence, some thyme (I like these two seasonings with chicken, but feel free to use your own favorites), and a squirt of dijon mustard. I whisked everything together and then let it cook slightly, while I put the chicken pies together. NOTE: I went into greater detail in a previous post, entitled “How to make a sauce” on this blog, so feel free to open another tab and use those directions if they seem clearer to you. I didn’t use any cheese in this sauce, as I did in the previous post, but the method is still the same. To assemble the chicken pies, I picked and shredded half of the chicken into two separate casserole dishes. I then drained two cans of mixed vegetables (this usually includes squares of carrots, potatoes, beans, and corn) and poured a can of the vegetables over the chicken in each dish. NOTE: Since I had cooked extra celery and the broccoli stems, I sliced and added these as well, although they weren’t necessary. I then spooned the sauce evenly over both dishes to finish off the inside of the chicken pies. NOTE: I wasn’t sure if my neighbors were watching their salt intake, but knew that I would need to add a little more “umph” to our sauce, so I added a few dashes of Worcestershire sauce to the sauce in our dish. This isn’t necessary either, but it’s a flavor I know we like. 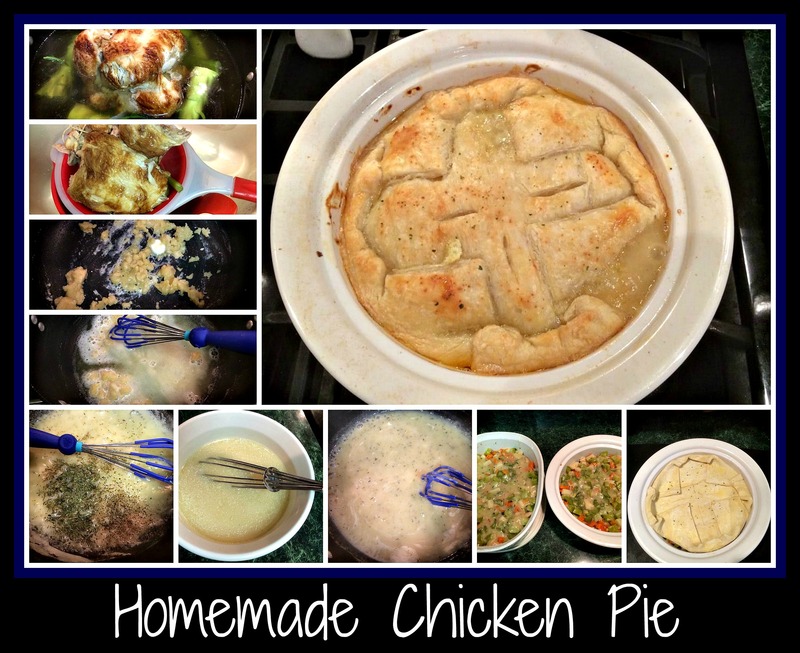 For the topping of the chicken pie, you can go in a variety of directions. For this version, I used a box of Puff Pastry dough. I allowed the dough to thaw for 15-20 minutes, then laid the dough on top of the dish, folding the edges over and brushing everything with an egg wash (mixture of egg and water) to make a nice crust. I also sprinkled our dish with some garlic salt, since that’s a favorite in our house. NOTE: Be sure to make 3-4 slits in the top of the pie to allow steam to escape during the cooking process. To bake these beauties, preheat your oven to 400 degrees and pop the chicken pie into the oven for 30-40 minutes, or until you see bubbling sauce coming up through the edges of the slits. NOTE: You need to cook Puff Pastry version at a higher temperature. You can decrease the oven temp to 375 degrees if using another topping of choice. Remove the chicken pie from the oven and let it rest for a few minutes before serving so no one burns their mouth on food that is, to quote my husband, “hotter than the sun”. NOTE: If you don’t want to use Puff Pastry dough for your topping, you can use a can of biscuit dough, a pie crust, or some homemade Bisquick topping. Whatever you choose, make sure you cook the dish long enough to allow the topping to cook thoroughly. I do hope you’ll try this recipe sometime soon. As the Fall approaches and the weather gets cooler, this meal is a staple in our house. It always reminds me of my childhood and never fails to bring a smile to my face. May this become a staple in your home as you create those same memories for your own families. Enjoy! This entry was posted in chicken, Cooking, Recipe, Wine and tagged Chicken Pie, puff pastry, sauce, vegetables, white wine.